Louis urges the family to make new friends at a neighborhood block party, but Jessica must choose between a budding friendship and neighborhood gossip that might be bad for Cattleman's Ranch Steakhouse. Meanwhile, Eddie tries to earn respect from other kids in the neighborhood. The episode is currently on Hulu. Hong Kongnese-Canadian here, arrived a little over a decade before the show is set, at about the same age as the show family. I'm up to ep5 and can't decide if I like this show or not. 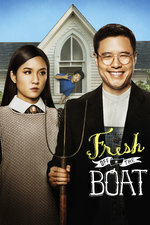 There are certainly lots of truisms that were "nostalgic" but I absolutely cannot stand Randall Park's fake-smiling effeminate character. Maybe not effeminate, but certainly less-than-masculine. I grew up as a stoner-nerd and never identified with black culture since it was essentially nonexistant in the Northwest, but Edie's identification with hip hop (is there a better term that I could be using?) speaks loudly of the lack of rolemodels for young asian immigrants. His dad certainly isn't a desirable rolemodel in this society. The younger brothers' apparently smoother integration is one of those things that were pretty spot on for me. I've seen so many families, who arrived about the show family's age, where the eldest brother(s) had much less social status compared to the younger brother(s) or sisters. I assume that at a younger age kids haven't absorbed as much institutional racism and this earlier exposure leads to less Othering later on, but there must be something else going on. The story of the mom's attempts at integration into the neighbourhood has potential. Porpoise, I find Randall Park smoking hot on FOB, not fake-smiling effeminate. I've been holding off on showing FOB to my kids because I wanted to make sure it was decent. They adored Everybody Hates Chris, and FOB has a lot of that same sweetness plus the immigrant experience. There are problems but Constance Wu is so good and the show has so much potential. Constance Wu is pretty great, though. My mom did a stint as a real estate agent. Then had a mental breakdown and left us for a while before coming back as a "retired" person. I might not forgive the show if Jessica Huang doesn't go through that cliche. Sorry viggorlijah that we disagree about Randall. I feel that his Kim Jong Un potrayal was less Asian=weak than his Uncle Tom-esque Louis Huang character. Through e06, I'm liking the show more, but liking some of the characters less. I see the characters all coping with their often difficult position as "exotic/foreign" in the very white, suburban Florida setting of the show. Jessica tries to blend in, but isn't shy about saying she's not convinced or confused by what she hears, while Louis is trying very hard to market himself as just a normal guy, with a normal western restaurant, so he smiles a lot and puts on a good show, and serves as an opposite type in many cases to Jessica. I don't see him as effeminate, and while I understand the Uncle Tom reference, I think he's that subservient.